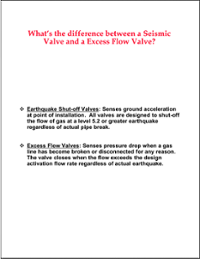 What Are Seismic Shut-Off Valves? 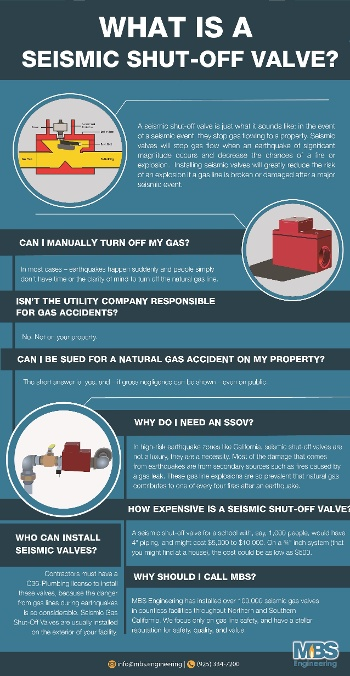 ​Seismic shut-off valves are a simple but effective way to ensure you never experience a gas fire after an earthquake. They are designed for earthquakes, accidents and any event of impact. We have installed thousands of automatic gas shut off valves to the manufacture’s specification to ensure safe, trouble free use. The seismic valves work on a simple, consistent and accurate principle. A sensor moves when the valve is subjected to a 5.4 magnitude or larger earthquake, releasing the valve float which blocks the line and prevents gas going in to the building. The valve is then manually reset once a safety inspection has been done and you’re sure there are no leaks in the building. Each valve is tested and certified before leaving the factory to meet approval from the State Board of Architect and LA Counties stringent requirements. They are tested to ASCE 25-97, State of California 12-23-1 & ANSI Z21.70-1981 Standards for Seismic Gas Valves. Some cities and counties in California have regulations that require the installation of automatic gas shutoff devices, which may include excess flow gas shutoff valves and/or seismic gas shutoff valves. Regulations vary, but generally apply to new building construction, or significant alterations or additions to existing buildings. If a customer installs an automatic gas shutoff valve, it should be one that is certified by the State of California and it should be installed by a licensed plumbing contractor in accordance to the manufacturers instructions. PG&E does not install or service seismic actuated or excess flow gas shutoff valves, or recommend specific contractors for customer applications. ​Non-emergency shut offs will occur if the automatic gas shut off is not installed according to manufacturer’s specifications. For example, the impact of heavy vehicles can trigger a non-emergency shut off. hey operate on movement and shut off the supply of gas to a building, when triggered by a 5.4 magnitude or larger Earthquake. Earthquake valves, or seismic shut-off valves, are used as a safety device to shut off natural gas lines in the event of an earthquake. They generally are installed on the exterior of a residence or business in order to stop gas ﬂow when an earthquake of significant magnitude transpires. This will decrease the chances of a ﬁre or explosion and prevent damage to structures. These are available in sizes from ¾” up to 8”. Models differ based on the orientation you will install these valves (horizontal, vertical up, vertical, down). 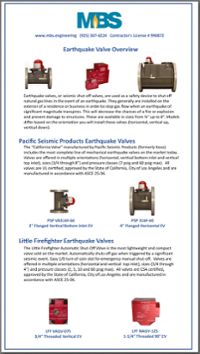 The “California Valve” manufactured by Paciﬁc Seismic Products (formerly Koso) includes the most complete line of mechanical earthquake valves on the market today. Valves are offered in multiple orientations (horizontal, vertical up, vertical, down), sizes (3/4 through 8”) and pressure classes (7 psig and 60 psig max). All valves are UL certified, approved by the State of California and are manufactured in accordance with ASCE 25-06. MBS trained team are experts in installing these types of automatic gas shut-off valves in commercial and residential buildings. 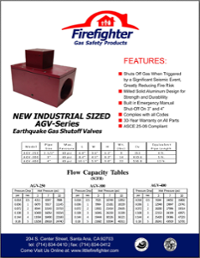 The Little Firefighter Automatically Shut-Off Valve is the most lightweight and compact valve sold on the market. Automatically shuts off gas when triggered by a significant seismic event. Easy 1/8 turn of coin slot for emergency manual shut-off. 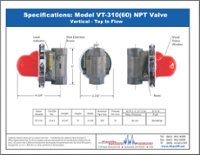 Valves are offered in multiple orientations (horizontal and vertical top inlet), sizes (3/4 through 4”) and pressure classes (2, 5, 10 and 60 psig max). All valves are CSA certified, approved by the State of California and are manufactured in accordance with ASCE 25-06. Price: The cost of the valve is going to vary based on the type and size of the valve, as well as the installation requirements and the company installing it. Choosing a valve: In order to choose the right valve size and manufacturer, contact your local Department of Building and Safety to find out their earthquake valve requirements. Where to buy a valve: You can purchase a earthquake or excess-flow valve at supply retailers, licensed plumbing contractors, or directly from the valve manufacturer. Using a contractor: You can hire a qualified professional to install the earthquake or excess-flow valve on your house line. Your local utility company will not install an earthquake or excess-flow valve for you. Why Would A Facility Require A Seismic Gas Valves? The threat of earthquakes in the state of California is constant. When an earthquake hits, they can cause large scale damage to structures and property, including to the natural gas lines feeding these structures. Breaks in natural gas lines during earthquakes are very common, and can lead to fires or even explosions that are more damaging than the earthquake itself. With a seismic gas shut off Valve installed, these fires and explosions can be easily prevented in the event of an earthquake. Where Are They Usually Located? Seismic Shut Off Valves are typically located on the customer side of the utility meter set. For large facilities they can also be located on branch lines or at building connections. 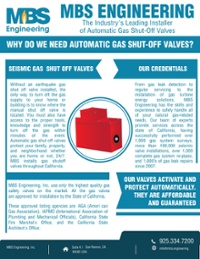 How Do Seismic Shut-Off Valves Operate? Seismic gas shut off valves are installed downstream of the utility gas meter set for a gas line entering a facility or residence. They are actuated by motion of earthquakes, accidents and other events of impacts. The design is very simple, and the valves will automatically shut off the flow of gas in the event of seismic activity that is magnitude 5.4 and larger. 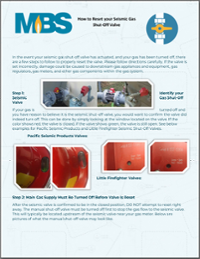 Gas shut off valves are an essential component of any effective safety program!